The TD Bank Five Boro Bike Tour, to be held on May 1, 2011, will involve 32,000 participants on the 42-mile course throughout New York City’s five boroughs, which will be car-free thanks to the collaboration of the NYC Department of Transportation. It’s the largest such event in the City, second only to the Marathon. Slots for last May’s ride were filled within days after the application process opened in February, so organizers are expecting that riders who get shut out will be seeking those slots reserved to the charities for fundraising purposes. In addition to allowing the Charity Partners to raise funds through these guaranteed entries, Bike New York will also encourage all entrants to choose a charity for which they can raise funds through their riding. Bike New York will list the top fundraising teams on its website and give prizes and recognition to the teams and individuals that raise the most funds. As noted in the list of attributes for suitable Charity Parners, taking advantage of a social networking component by now is a well-recognized way to take such athletic event fundraising to a wider base, as participants spread the word through Facebook, Twitter and other media. This past weekend’s NYC ING Marathon was able to generate over $30 million for charities through such efforts, according to Ed Norton’s Crowdrise site. The practice of marrying athletic events with fundraising is well-established, with participants magnifying their own physical efforts to raise awareness by securing pledges to match each mile. Fundraising for numerous causes has benefited from the growing popularity of events like the NYC Marathon, which regularly has more applicants than available entries these days. Potential marathoners have learned that additional slots can be obtained through organized charities, such as the Red Cross, if they’ll commit to raising funds through their participation. This past weekend in NYC, for example, 46 Team Red Cross runners from the American Red Cross in Greater New York (ARC/GNY) ran the popular event, after each pledged to raise or donate at least $3,500 to support the Chapter’s efforts to help New Yorkers prevent, prepare for and respond to emergencies.Team Red Cross was expected to finish at $200,000. The New York Road Runners, the nonprofit organization that manages the race, now has 190 charities, up from 14 in 2006, when the program began. About 7,400 runners from a field of 43,000 will run for charity, offering a way in to the race for those who get shut out of the lottery, do not qualify by time or cannot participate in the required 10 Road Runners races. 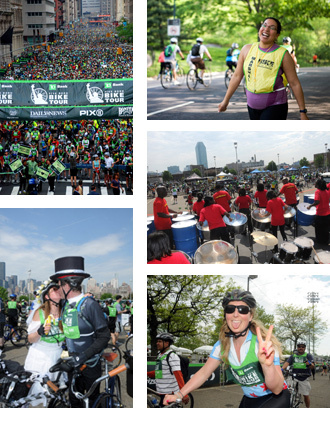 Charities looking to partner with the Bike New York TD Five Boro event should apply now. Applications will be accepted until Tuesday, November 30, and Charity Partners will be notified of their selection by December 7. Organizations must have 501(c)3 status in order to participate.